As the threats posed by global warming increasing, the need to implement renewable energy increases as well. One of the greatest sources of renewable energy is solar energy. Now, to harness solar energy something known as solar panel is required. These are a combination of photo voltaic cells that supply electrical energy when rays of the sun fall on the solar panel. There are however, a lot of limitations to solar energy. For example, the efficiency of these solar panels is quite low, usually around 30 percent. Thus, more number of solar panels are needed to generate sufficient energy. Their power generation also depends on the weather and can only work while there is sunlight. Another problem that is faced, is the high price of such solar panels. But, slowly as technology progresses, these limitations are becoming less troubling. The biggest advantage is that after installation, you will not need to pay a penny. You will get free electricity and leave much smaller carbon footprint than ever before. To harness this solar energy, you will require a generator and solar panels. This system helps generate the energy and store it safely for proper use. Here is a list of the best solar powered generator kits in 2017. 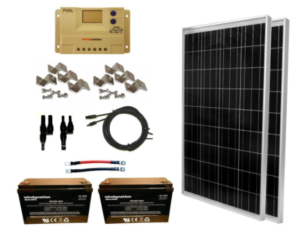 This solar power generator kit from Renogy comes all – inclusive with the required brackets and wires needed for installation. Now, you do not need to ‘call a guy’ just to get this installed in your house. You can try doing it for yourself using the instruction manual provided. The panels are 18.4% mono-crystalline. This allows for a higher rate of conversion from solar to electrical energy. It also comes with a 40A MPPT charge controller. This controller checks the current and prevents overcharging of the battery, short-circuiting, over loading and reversing the polarity. It uses a 4-stage charging process that helps it charge quickly and efficiently. Because of the smart circuits, this displays a peak efficiency of 97%. It also comes with a RJ45 interface that you can use to connect with the MT-5 meters at your homes to check the usage regularly. The charge controller is rated IP65. This means that it has good dust protection and moderate waterproofing. So, you can leave this charge controller out in the rain without worrying about it at all. It has a high peak efficiency. You will need to purchase a battery. This dual generator from Eco-worthy will help you overcome the limitations of your Solar generator. The Solar Panel (dimensions mentioned above) accounts for about 100 W of the energy generated. On the other hand, the turbine is capable of generating 400 W with a good wind speed. So, if you get stormy weather instead of a sunny day, your wind turbine will kick in and generate power as well. You can set this up on your roof and attach them to a battery to store the energy. However, you will need a pole to set the wind turbine on. The wind turbine requires a minimum wind speed of about 10.5 m/s. It weighs 17 pounds and is 27.1 x 14.4 x 8.3 inches in size. The blades and turbine is corrosion resistant. Hence you don’t need to worry about rains or other corrosive weather. here is a detailed manual provided that will help you to install this yourself. However, you might need to buy brackets and wires to set this up properly. The solar panel on the other is mono crystalline thus increasing its efficiency. This is also the reason why the price is a bit on the higher side. If you wish, you can go for the poly crystalline alternative. The whole package comes with a 12 V / 24 V controller. This controller automatically detects the voltage according to the power output from the generators and accordingly supplied current to the battery for charging. It has an alternate power source. The win turbine requires very high wind speeds to work. 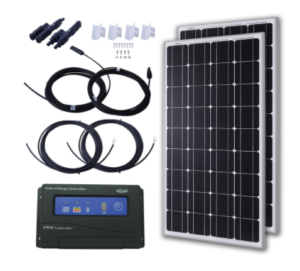 This solar panel kit from Grape Solar comes with 4 solar panels (thus the high product weight and dimensions), a controller, connecting wires and an inverter. This explains the high price. However, you will need to buy brackets to mount this set-up on your roof. You also need to purchase a 12-volt deep cycle battery to store the generated energy. The solar panels are poly crystalline which are less efficient than the mono crystalline alternatives, but they are also comparatively cheaper. They are made of anodized aluminium and tempered glass. This enables it to be extremely durable and strong. It won’t get damaged by small falls. The same seal also makes it weatherproof. Thus, you don’t have to worry about leaving it outside in the rain or a minor dust storm. Each panel also consists of a two-diode junction that improves the performance of this panel compared to the other ones in the market. The controller that comes with this is a 35 A controller by Xantrex it is a Pulse Width Modulator (PWM) and can operate both in the 12 V and 24 V range. This is accompanied by a 2000-watt sine wave inverter also by Xantrex. This inverter has 2 power outlets and a USB port. So, you can charge your USB devices and run pumps or lights using this system. It also has a few safety features that prevent the battery from overcharging and the short-circuiting. The Solar panels are quite durable. It has a high power output. The solar panels are relatively heavy. 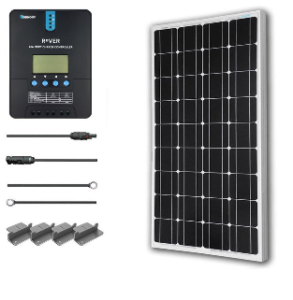 This Solar power kit from SunForce comes with four 15 W solar panels, an inverter, a controller, and connecting wires. It also comes with the stand required to fix it at an angle. Thus, they are perfect for mounting on your RV, cabins or your homes. If you want to mount these in any other orientations, you might have to drill holes carefully at the edges. 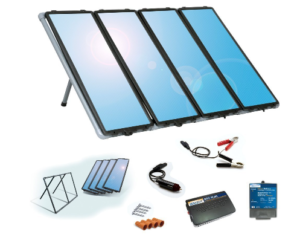 You will also need a battery to store the energy that is generated by this solar power kit. These solar panels are amorphous. This technology helps them generate electricity even if the sun is obstructed by some clouds or the panels aren’t receiving the full light intensity from the sun. The operating range of these panels is from -40 to 176 degrees Fahrenheit. They are made so ruggedly that they can withstand impacts from hail travelling at speed up to 50 miles an hour. The controller is a 7 A version and can be used for 12 V batteries. The inverter ensures that there is no back current during the night from the battery. It also comes with Quick Connect technology. The controller also prevents from short circuiting and overcharging of batteries. The whole set-up is weather proof and you need not worry about leaving it out in the rain. The size and shape makes it a perfect fit for any location to be mounted on. It has a very wide operating temperature range. Very expensive for solar panels. This is Solar power generator kit from HQST is made for people who aren’t experienced with using solar panels. It comes with a controller, connecting wires and brackets to help you put up the two solar panels on your roof or at a suitable location. The holes have already been drilled into the panels for easy installation. It is perfect for use on recreational vehicles, cabins or even boats! You will however, need to buy a battery to store the energy that it creates. It can charge a 50 Ah capacity battery in 3 hours from 50 percent to full charge. The panels are a set of 2 monocrystalline panels. They can be used for either 12 or 24v volt arrays. A 20 A Pulse Width Modulator (PWM) controller helps to control the current generated by these panels. The high-end technology helps it produce power without any noise whatsoever. This controller is IP65 rated. That means it is dust proof and water proof. You won’t need to worry about leaving this device out in the storm for a while. Depending on the amount of sunlight received, it can generate about 500 Wh per day. The 20 feet AWG adaptor cables help transmit this energy to different parts of the house or a battery if you prefer. The cables can operate in a temperature range of -40 degrees to 185 degrees Fahrenheit. This makes it perfect for water pumping or lighting systems. It also has a wide operating temperature range. This product has great value for money. You have to buy an inverter and battery. It is relatively slow while charging a battery. This 480-watt solar power generator by Go Power is probably one of the most expensive ones on the list. Ne informed that the dimensions mentioned are the shipping dimensions and not that of the solar panels themselves. 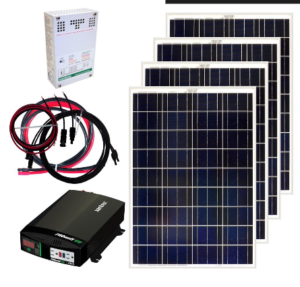 The whole package comes with three 160 W solar panels, smart battery charger, sine wave inverter, solar controller, connecting wires, mounting brackets and even transfer switches. So, the only thing you need to buy is a deep cycle battery to store the energy. Alternatively, you can use this whole set up to power your entire house including televisions, blender, computers and even audio equipment during the day, when there is sunlight. The battery will come of use at night. The inverter included in the package is a heavy duty 3000-watt pure sine wave inverter. It has an input of 12 volts only. But, it can power almost household appliance with it. The solar controller which rated at 30 A is also quite advanced. IT can prevent overcharging and short-circuiting. This will help your battery last longer in case you are prone to voltage fluctuations from your devices or otherwise. It also includes a ‘Maximum Power Boost Technology’ that helps it override the normal charging algorithms. This enables it to charge your battery faster than the normal rate ensuring that the battery is always fully charged for the night. Along with these things you also get a 75 Amp smart battery charger and an inverter remote. A 30 A transfer switch helps switch between the utility power and the inverter power automatically. It also prevents damage from any back current generated if the inverter is directly linked with the AC electrical system. The Maximum Power Boost technology is extremely helpful. The transfer switch works perfectly while switching power sources. 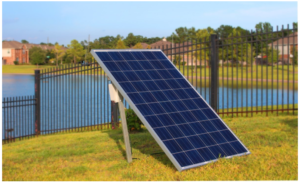 Windy Nation brings to you one of the best deals in Solar panel kits. 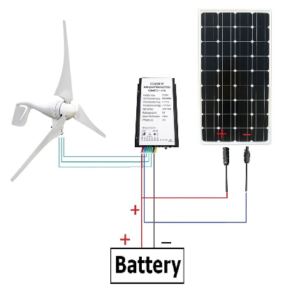 This solar power generator kit includes two 100 W solar panels, 20 A PWM charge controller, mounting brackets, connecting wires and two 100 ah batteries too! You don’t need to buy anything else. All you need to do is get this installed for free energy for the rest of your life. This generator is meant for power back up or for RVs and other minor purposes. You can use this to charge 12 V batteries or in series to charge a 24 V battery. This can provide up to 820 Watt hours of energy per day depending on the amount of sunlight received by the solar panels. If you feel it’s necessary, you can opt to buy an inverter along with this. The controller included in this pack can handle 300 W for 12 V battery systems or 600 W for 24 V battery systems. It is a pulse width modulator (PWM) with an LCD screen. This shows you information like state of charge, voltage, DC load etc. It can be connected with lead acid, AGM gel or lithium batteries. The controller can also help prevent overcharging and short-circuiting of the battery, thus giving it longer life. The settings of the controller can be modified by you to suit your needs. The Komaes Solar Panel kit is here to give you free energy for the rest of your life. 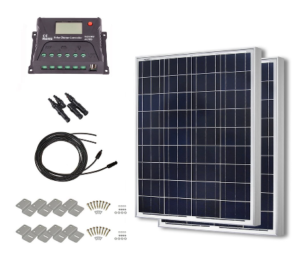 It comes with two solar panels, a 20 A charge controller, Solar MC4 connectors, connecting cable and mounting brackets. It also comes with pre-drilled holes and an instruction manual for easy installation. You can set it up wherever you wish – on top of your RV, roof or boat. Depending on the amount of sunlight received by the panels, you can use this system to generate up to 1000 watt hours every day. It is also capable of charging a 50 Ah battery from 50% to fully charged condition in just 1,5 hours. The solar panel itself is a grade A mono crystalline version. This means that you will get a higher conversion efficiency. The frame is made of anodized aluminium and is thus corrosion resistant. The glass used is tempered. This enables it to sustain pressures of up to 5400 Pa. It can also withstand heavy winds of up to 2400 Pa. This glass is also designed to transmit 93% of the sunlight thus making it one of the most efficient solar panels. The charge controller that comes with this kit is a Pulse Width Modulator (PWM) and is rated at 20 A. It will help prevent overcharging and short circuiting of the battery. This also enables the battery to charge automatically as long as the solar panels are receiving enough sunlight. With the help of this, if you want, you can increase the size of the array to 400 watts too! This Solar Power Generator Kit by Ensupra can power an inverter up to 1000 watts. 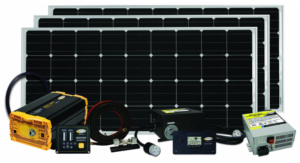 The Kit offers one 250 – watt solar panel, a 1000 W inverter, connection cables, a ground mounting rack and a built-in solar charge controller. You can also choose to get the ‘Z’ mounting brackets if you want. However, you will need to buy a battery if you intend to use this solar power generator at night You can easily set it up either in your front lawn or your roof – whichever area gets the most amount of sunlight. At its peak, it can charge the battery with 250 watts of energy per hour. But, it usually gives 240 watts of power. The solar panels are made of polycrystalline silicone. These aren’t as efficient as the monocrystalline versions, but they are cheaper. This set up is perfect for TVs, fans, lights, RVs, small fridge etc. It should mainly be used for back up energy purposes. It is best to connect it with a deep cycle battery of 24 volts (2 x 12 volts). The inbuilt solar charge controller in the inverter will ensure that there the battery doesn’t undergo overcharging or short-circuiting. The solar panels come with a 25-year warranty from the manufacturer. On the other hand, the inverter and the charge controller come with a one year warranty. Comes with a long duration of warranty. Very few new versions are up for sale. The charge controller does not show much information. 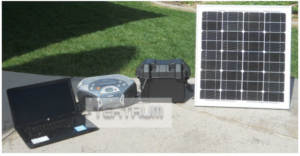 The final Solar Power Generator Kit on our list is from Tektrum. It comes with a solar panel and an all-in-one station box. The station box includes an inverter, an AVM battery and a charge controller. This power station allows charging from wither the solar power or from a wall charger. The simple design allows you to simply plug it in and use it. However, if you do get confused by any aspect or have any queries, there is also an instruction manual included in the package. The Solar Panel can give out an output of 100 watts. But, there are extension terminals provided. Thus, you can choose to attach more than one solar panel for more power output or faster charging of the battery. The power station is 12 x 11 x 8.5 inch in size. It has a 1000 – watt inverter installed in it that can give a maximum output of 2000 watts. This also contains a 26 Ah deep cycle AGM battery. This saves you all the problems of a lead acid battery like no spills, leaks or frequent maintenance checks. The rugged design helps the station survive some small impacts. Using the solar extension cables, you can connect this power station to the solar panel at an optimum distance. With that, we end our list of the best solar power generator kits that available in 2017. However, there are quite a lot more. These were kits available from particular companies. If you want, you can choose to go with building your own kit. All you would need is a deep cycle battery, highly efficient collar panels, an inverter, and a solar charge controller. It goes without saying that you will also need auxiliary equipment like mounting brackets and connecting wires. You could also try and include a wind turbine up there if it gets especially windy near your area. I’m sure that after going through this article you have realise that it is indeed possible for solar power to supply you with energy for almost all your daily needs. The drawbacks like initial charges and poor efficiency persist. However, we are certain that soon there will be a solution to these as well. With the world on the brink of destruction because of excessive gasses released by man, it is imperative that we try and find out what we can do to help. Switching to solar power is definitely the way to go. Besides, after installation, it’s basically free energy! So, take the first step and buy your Solar Power Generator Kit now!